Set in the Municipality of Clarington, Courtice is a growing community located about 60 kilometers east of Toronto, Ontario. The inviting area features attractive open countryside, acreage, and striking wilderness land along Lake Ontario. Although new residents are attracting some new businesses, Courtice generally serves as a bedroom community for employers in Toronto and in the Durham Region. Courtice is between Oshawa and Bowmanville. Boundaries are Townline Road (west), Hancock Road (east), Highway 401 (south), and Pebblestone Road (north). Residents can easily hop on Durham Road 34 to connect to Highway 401 into Toronto. Bus and commuter trains connect to Courtice as well. Courtice real estate includes historic properties and a splash of new home developments. Now part of Courtice, the former Prestonvale area dates back into the 1800s. 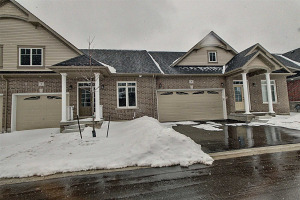 However, brand new Courtice homes for sale are turning heads of homebuyers this way. The Courtice area features one of the finest collections of new homes in Greater Toronto. New home developments include Prestonvale Heights, Courtice North, Springfields, Kingsway Forest, McLaughlin Heights, Durham Fields, Robinson Ridge, Bloomfields of Courtice, Foxhunt Trails, Oakfield Heights, and other picturesque subdivisions. Excellent builders offer a wide variety of styles and high-end finishes. Energy efficient and high-tech features of new construction appeal to the modern market. A large number of one- and two-story designs with 1300 to over 3000 square feet of well-planned living areas suit the needs of today’s buyers. New home prices are generally in the $300,000 to $500,000 range. Immediately south of Courtice is the scenic Darlington Provincial Park and wilderness area. Recreational activities include hiking, fishing, boating, birding, camping, picnicking, ice-skating, sled riding and playtime along the sandy beaches of Lake Ontario. Lush wilderness attracts birds and wildlife. Recreational facilities include the South Courtice Arena for ice-skating and Courtice Community Complex for swimming and fitness activities. Shopping districts such as Kingsway Village feature all of the large and small stores residents need. The Kawartha Pine Ridge District School Board and Peterborough Victoria Northumberland and Clarington Catholic District School Board operate ten schools serving Courtice. Mostly residential, Courtice is beginning to see some new commercial and business areas. Residents tend to commute to nearby employment in Pickering, Oshawa, and to Toronto.